Works of art produced by any distinctive creative personality will borrow from and build on prior themes. Similarly, in these essays, Roy Ascott employs a palette of theoretical images drawn from many sources, including Jackson Pollock and Marcel Duchamp, the theories of cybernetics, quantum physics, and telematics, and the metaphysical ideas of Pierre Teilhard de Chardin and non-Western cosmologies, which he re-renders and re-contextualizes in original compositions. His theories progressively gain complexity and depth and are always presented in a compelling manner, which is at once poetic and convincing. Because Ascott's essays are generally quite short, abridgment would in most cases seriously detract from their integrity. Except as noted, the texts selected for this book are therefore included in their entirety. Occasionally, minor editorial alterations have been made to enhance clarity. British spellings have been largely retained, and despite the author's and editor's preference for gender-inclusive language, we also decided to retain the original gendering of pronouns. Ascott's message is one of inclusion and unification, and it is hoped that all readers will feel equally welcome in his telematic embrace. 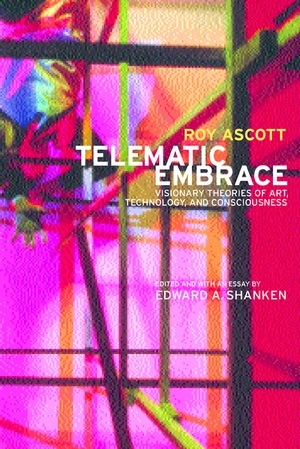 The introductory essay "From Cybernetics to Telematics: The Art, Pedagogy, and Theory of Roy Ascott" is intended as a basic framework to assist the reader in contextualizing and evaluating the artist's writings, providing a general overview of Ascott's work, briefly describing his intellectual background, and sketching out the problem of artists' writings. It also offers a discussion of cybernetics and telematics and their relationship to Ascott's work as an artist, teacher, and theorist. Roy Ascott is still actively making art, teaching, and writing theory, but I have addressed his work in the past tense in order to retain consistency and provide a proper historical tone. Kristine Stiles sensed that Roy Ascott and I were a perfect match, arranged our meeting in 1994, and encouraged us to pursue this project together. Without her knowledge, dedication, patience, and editorial assistance, my efforts would have amounted to substantially less. My large and extended family has blessed me many times over by supporting my dreams with love and enthusiasm. The Duke University Department of Art and Art History, Graduate School, and Center for International Studies generously supported my dissertation research, a substantial portion of which appears in my essay. A Henry Luce fellowship from the American Council of Learned Societies made an invaluable contribution to the final stages of writing. Thanks are also due to all the artists and critics who offered personal insights into telecommunications art. These include Robert Adrian, Liza Bear, Hank Bull, Peter D'Agostino, Allan Kaprow, Carl Loeffler, Willoughby Sharp, Woody and Steina Vasulka, and Norman White. Eduardo Kac generously edited earlier drafts and provided excellent comments. Deborah Kirshman at the University of California Press embraced this project from the beginning and patiently supported the process that brought it to fruition. Finally, I would like to thank Roy Ascott for the honor of editing this collection of his writings and for the love he shown by entrusting them to me. Long before e-mail and the Internet permeated society, Roy Ascott, a pioneering British artist and theorist, coined the term "telematic art" to describe the use of online computer networks as an artistic medium. In Telematic Embrace Edward A. Shanken gathers, for the first time, an impressive compilation of more than three decades of Ascott’s philosophies on aesthetics, interactivity, and the sense of self and community in the telematic world of cyberspace. This book explores Ascott’s ideas on how networked communication has shaped behavior and consciousness within and beyond the realm of what is conventionally defined as art. Telematics, a powerful marriage of computers and telecommunication, made technologies we now take for granted—such as e-mail and automated teller machines (ATMs)—part of our daily life, and made art a more interactive form of expression. Telematic art challenges traditional relationships between artist, artwork, and audience by allowing nonlocal audiences to influence the emergent qualities of the artwork, which consists of the ebb and flow of electronic information. These essays constitute a unique archaeology of ideas, tracing Ascott’s meditations on the formation of consciousness through the intertwined cultural histories of art and technology from the 1960s to the present. Shanken’s introduction situates Ascott’s work within a history of ideas in art, technology, and philosophy. Given the increasing role of the Internet and the World Wide Web in the creation of commerce and community at the dawn of this new millennium, scholars, students, laypeople, policymakers, and artists will find this collection informative and thought-provoking. Roy Ascott is President of the Planetary Collegium at the University of Plymouth, England and Adjunct Professor in the Department of Design/Media Arts, University of California Los Angeles. Edward A. Shanken is Professor of Art History, Savannah College of Art, Georgia.